Giant Panda: Giant Pandas are black-and-white Chinese bears that are on the verge of extinction. These large, cuddly-looking mammals have a big head, a heavy body, rounded ears, and a short tail. The largest pandas grow up to be about 250 pounds, about the weight of a large adult human. They are about 5.25 to 6 feet long. The average adult male panda grows to be about 3 feet tall at the shoulder and weighs approximately 220 pounds. The average adult female panda grows to be about 2.5 feet tall at the shoulder and weighs about 180 pounds. Pandas spend up to 16 hours of each day finding and eating bamboo. The Panda is different from other bears. It has cat-like eyes and unusual hands with 5 claw fingers plus a wrist bone that moves like an opposable thumb. A black and white cutie, this Cushy Kid baby panda bear will brighten anyone's day. 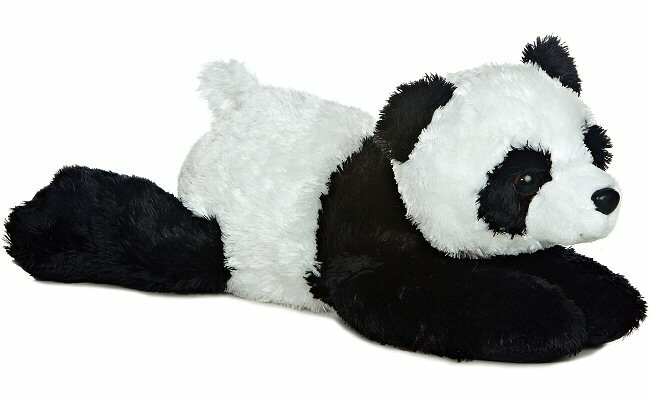 Cherry, this adorable Li'l Sweet & Sassy stuffed panda bear, has soft white and pink fur and beautiful heart-ringed eyes.